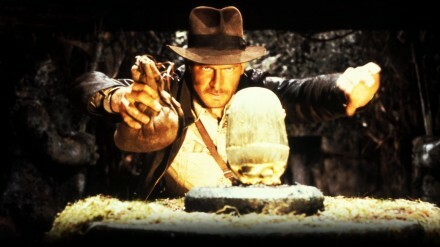 The Academy of Motion Picture Arts and Sciences is having a 30th Anniversary screening of "Raiders of the Lost Ark" at the Samuel Goldwyn Theater in Beverly Hills on Friday, June 17, a mere five days after the actual release date in 1981. I've been really excited about this because they'll not only be showing a brand new digital print of the movie straight from Paramount, but Frank Marshall and Ben Burtt (among others) will be on hand for a very special Q&A. Click on the photo for full details. This promises to be THE anniversary event for the film and I wouldn't want to miss it for the world! But we almost did. I'd read last week that tickets were going on sale June 1. So I very precisely set the alarm on my iPhone to go off at midnight last night. When it rang I went online and saw that tickets weren't up yet. This morning I did the same and still nothing. Then, as I called Rebecca to let her know I was leaving for work, the little icon on the ticket page went from 'not yet' to 'buy now'. A few minutes later when I was stopping to pick up bagels for breakfast, I got on once again to actually buy tickets. As I progressed, a message came up that the screening was sold out. What?! You're kidding? !...I thought to myself. I called Rebecca at work to tell her what I was finding only minutes after the tickets became available. I could only surmise that they were perhaps holding everyone else back to allow Academy members the opportunity to buy first. Or perhaps everyone had been poised in front of their computers first thing in the morning and everything really was gone. Crap! Fifteen minutes later I was stuck on the 405 at a dead stop. I had to try again, maybe there had been a glitch on the site. I quickly grabbed my phone and refreshed the site. THERE IT WAS! The sold out notice was gone and you could actually purchase tickets!! Suddenly I realized I needed to pull over because maybe this wasn't going to last. Wasn't sure what had happened and didn't care...I needed to act! I began hearing John Williams music in my head as Indy fought the giant Nazi while gasoline inched towards a flaming tanker truck near the flying wing that held Marion. At the same moment the phone rang as I was changing lanes. It was Rebecca calling to tell me she had done the same exact thing right before I did and was able to buy tickets! WOOHOO!! So I want to officially say....Rebecca, you are a ticket-buying golden goddess!! THANK YOU!!! Now we have tickets in hand and I am SO HAPPY!! This will not only be an acknowledgment of the three decade milestone, but also a trip back for me...remembering the first time I saw "Raiders" in the theater back in the day when Steven Spielberg and George Lucas were true Hollywood Gods. Oh My Gravy! I am SOOOOO jealous! Yay Rebecca! Yay Indy! P.S. Have you had a chance to read my Raiders posts? But yes, wish you could be here for this!